Two British sailors have died in an accident on a nuclear submarine. The Ministry of Defence (MoD) confirmed there had been an explosion on HMS Tireless during an exercise under the Arctic icecap at 0420 GMT on Wednesday. One other member of the crew of the Devonport-based submarine was injured and is receiving medical treatment. Failed air-purification equipment is thought to have caused the explosion. The MoD expressed its "deep regret" and said an inquiry would be carried out. The SSN Attack Submarine was on a joint British-American exercise off the coast of Alaska when the incident happened. The MoD said a small explosion had caused "a small amount of smoke", which had been contained in the equipment and the immediate area. A spokesman said the reactor was unaffected by the accident and stressed Tireless was not one of the submarines that carries Trident missiles. The submarine was safe and on the surface, it confirmed. The dead sailors' next of kin have been informed and a statement is expected to be released on Thursday. An injured sailor was airlifted to a military hospital at Elmendorf Air Force Base near Anchorage with non life-threatening injuries and is expected to make a full recovery. In a statement, the MoD said: "The two members of the crew died as a result of the initial accident. "Their next of kin have been informed and our sympathies are with them and their friends at this difficult time." The MoD said the ship's company dealt with the incident "quickly and professionally" and, as a result, there was only superficial damage to the forward compartment. "The submarine was never in any danger, its nuclear reactor was unaffected, it quickly surfaced and is completely safe," the MoD added. A Board of Inquiry investigation will follow, with military investigators examining what happened to see if there are any wider implications and lessons can be learnt. Tireless was launched in 1985, but the piece of air-purification machinery thought to have failed was fitted as part of an update in 2001. The piece of equipment which malfunctioned is fitted to all Trafalgar Class submarines. The MoD said it had a 100% safety record to date but, as a precaution, its use on other boats would be restricted until safety checks could be carried out. Admiral Sir James Burnell-Nugent, Commander-In-Chief Fleet, said: "I very much regret that this incident has occurred and my thoughts go out to the family and friends of the men who have lost their lives. "I also wish to pay tribute to the crew of HMS Tireless that this incident has been dealt with and contained so professionally." Submarine expert Mike Critchley said it was easier for submarines to surface in the sea rather than in the Arctic, noting that it was fortunate that the ice in that region was thin. He said: "Other areas of the Arctic [ice] can be extremely thick and they could never have got up through it." The Tireless has suffered a number of problems over the years. In 2000 a fault was discovered on board, forcing all 12 hunter-killer nuclear submarines in the UK fleet to undergo intensive inspections. The submarine became stranded in Gibraltar in May of the same year with a leak in pipework leading from the nuclear reactor system. Her presence there for nearly a year while repairs were carried out put a strain on relations with Spain and caused outrage among environmentalists. In May 2003 she was taken to Scotland for repairs and prompted a MoD inquiry after colliding with an object at sea. The vessel normally carries a crew of 130. 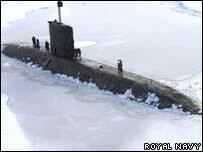 Since her launch, the submarine has completed a number of patrols from the North Atlantic to the Mediterranean, including several under-ice expeditions.